What is a Hemorrhagic Stroke? How Does a Brain Aneurysm Develop? What Happens When an Aneurysm Bleeds? How is a Brain Aneurysm Diagnosed? Should I Get a Second Opinion? 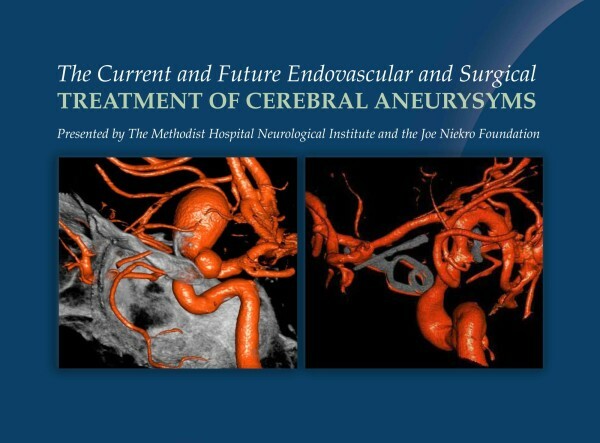 Each year, The Joe Niekro Foundation and the Houston Methodist Neurological Institute come together to present The Joe Niekro Foundation Symposium and Cerebrovascular Lecture Series. This two day meeting is designed to bring further awareness to the importance of early detection and treatment of cerebral disorders, while discussing current and future research advancements and clinical trials. This program is designed to meet the continuing educational needs of residents, fellows and allied health care professionals, especially related to the fields of neurosurgery, neurology, neuroanesthesia, neuroradiology and neurocritical care and emergency medicine, who want to enhance their knowledge in the management of patients with cerebrovascular diseases. 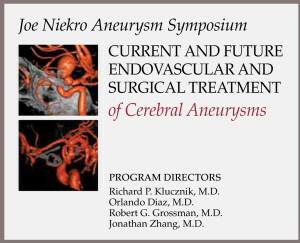 Information regarding surgical techniques and approaches, new minimally invasive interventional procedures, and the critical care of patients with these conditions are presented by Symposium Program Directors, Dr. Richard Klucznik, Dr. Robert Grossman, Dr. Orlando Diaz, Dr. Gavin Britz and Dr. Jonathan Zhang. Dr. Robert Spetzler and Dr. Charles Strother are among a few of the many keynote speakers who have joined us over the years. A very special thank you to the wonderful professionals at The Houston Methodist Neurological Institute for helping put this annual symposium together. What is a brain aneurysm? What are the risk factors of a brain aneurysm? What are the symptoms of a brain aneurysm? What are the dangers of a brain aneurysm? © 2019 Joe Niekro Foundation. All Rights Reserved. Every donation matters - every dollar counts. The Joe Niekro Foundation is a registered 501 (c)(3) which means your donations are 100% tax deductible. Your donations are used to enhance the research and treatment of brain aneurysms, AVM and hemorrhagic strokes, while supporting patients and families through the recovery process. The best way to keep up to date on all the JNF happenings. Sign up today for our Knuckle Up Newsletter!